The San Francisco Public Schools commission is running a marketing campaign right now. The slogan on posters dotted in bus shelters and elsewhere around town is "The City is Our Classroom." "That's all well and good," I thought as I walked passed a poster on a walk around the neighborhood this morning. "But that doesn't make up for the fact that classrooms, in the conventional use of the word, aren't necessarily doing their job anymore in this city." I was thinking in particular of my recent visit to San Francisco's rundown School of the Arts (SOTA) (see my blog entry of two days ago) which left a a bitter taste in my mouth. 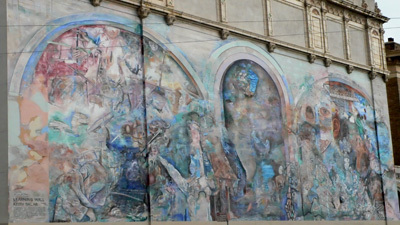 In this pensive mood, I walked around the corner and came across Keith Sklar's 1989 mural, "Learning Wall." Sklar's enormous, psychadelic triptych is looking really faded. I read somewhere online that the artist had scrubbed out some portions of it a while ago. Not sure if that's true, or if it is, why he would have done such a thing. I walk past Sklar's mural almost every day as I live close by, but not until this morning did I really stop to look at it closely. It's hard to figure out what's going on as the work is so busy. The main theme (a popular one in Bay Area murals) seems to be cultural pluralism. There are Inca heads, Chinese stringed musical instruments, Ancient Egyptian effigies and all manner of patterns and people. At the top is a motif of people holding hands. The whole thing swirls with color and texture like a giant bubbling cauldron of knowledge and ideas. I can't say it's beautiful to look at, especially in its current faded, grimy state. But it serves as a reminder that education was at one point prized in this city. The mural is painted, somewhat ironically, on the side of an old, vacant and rather beautiful Department of Education building. I heard rumors that SOTA is eventually supposed to move from its current location in the fog belt into these premises. Financing, I suppose, prevents this from happening any time soon (if indeed this plan is more than a rumor.) It would be great if SOTA would move downtown. That would put the arts high school right next to the Symphony, Opera, Ballet and Conservatory of Music, not to mention the New Conservatory Theatre Center, The Asian Art Museum, the main branch of the San Francisco Library, the Herbst Theatre and several private galleries. I imagine Sklar's "Learning Wall" is more likely to get a fresh coat of paint before that happens though. "At its inception, SOTA was a part of J. Eugene McAteer High School and was located at its present site on Portola Drive. In 1992, the school moved to a former elementary school at 700 Font Boulevard near San Francisco State University. In 2002, McAteer High School was dissolved, and SOTA (along with other high schools) was offered the site." That's what we like to do in the Bay Area..."dissolve" schools. Saw it happen my entire childhood and teen years. interesting, christian. and not very heartening.